Its that time of year again when we get all excited about music, food and boating events while compiling the Falmouth Week brochure! We’ve been asked to help with this project for the last two years and we’re delighted to work on the 2018 event. The programme is a 20 page glossy A5 guide with full listings of all shoreside entertainment and events taking place over the course of the week. There is an opportunity for local businesses to advertise within the brochure, so do get in touch if you’d like to be involved. 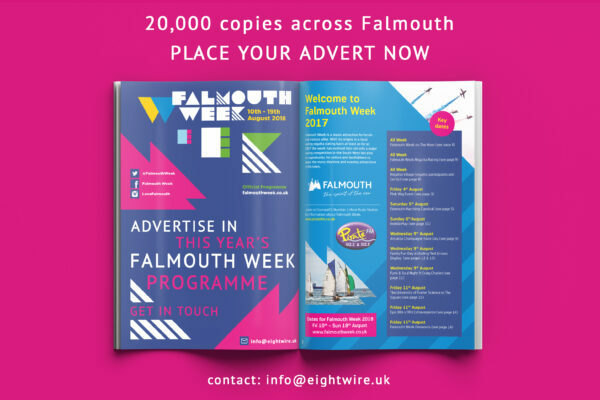 It has a print run of 20,000 and is distributed to all yacht clubs in and around Falmouth and the Helford, bars & restaurants, retail outlets and everywhere that distributes tourist information in and around the area in the run up to the event and during the week itself, providing several weeks of marketing coverage. There are only 5 pages allocated to advertising and they usually go quite quickly. For more info email info@eightwire.uk. Alternatively you can call us at the studio on 01326 376880.